This book is fantasy for old souls. There are no werewolves or vixens or fae, no technology run amok or vampires on killing sprees. There is simply a golem, a woman made out of clay and brought to life by a mysterious master of Jewish mysticism, and there is a jinni, a desert-dwelling spirit of fire. 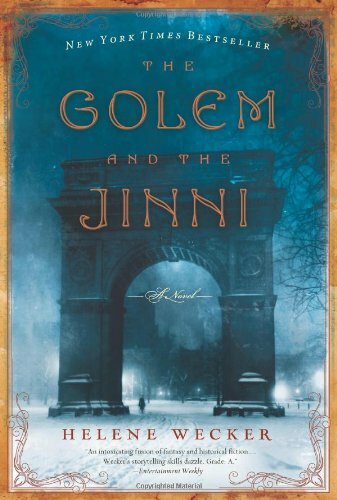 The golem and the jinni's paths cross in New York City in the early 1900s. The golem is adrift, brought to life by a master who died soon after, kept safe by a kindly elderly rabbi who recognizes her true form. The jinni is only recently released from a thousand-year captivity in a copper flask, still bound to a master who must be long dead. When they meet, and eventually share their secrets with each other, they become the unlikeliest of friends. There's plenty of danger and suspense as they realize they share a common enemy, an incredibly powerful man who threatens to destroy them both. However, the most compelling aspect of the book is the sweet bond the two unique beings forge. They are very different, but they complement each other in the most serendipitous of ways. Watching how they each choose to use their mysterious talents is a delight—the golem, created for subservience, can hear people's inner desires, and the jinni, though trapped in human form, can channel heat through his hands to melt and mold metal. Before starting this book, I was concerned that since it isn't about humans, the character development would be flat and lifeless. I am thrilled at how wrong my assumption was. The golem and the jinni are beautifully, vividly realized, and the revelation of their innate humanity is deeply satisfying. Bottom line: Set aside a week of your life and read this book. You won't regret it.